Enhance your USB Flash Drive experience (beta). More Apps Corsair Memory, Inc.
Is there a better alternative to CorsairDriveTools? Is CorsairDriveTools really the best app in File Management category? Will CorsairDriveTools work good on macOS 10.13.4? 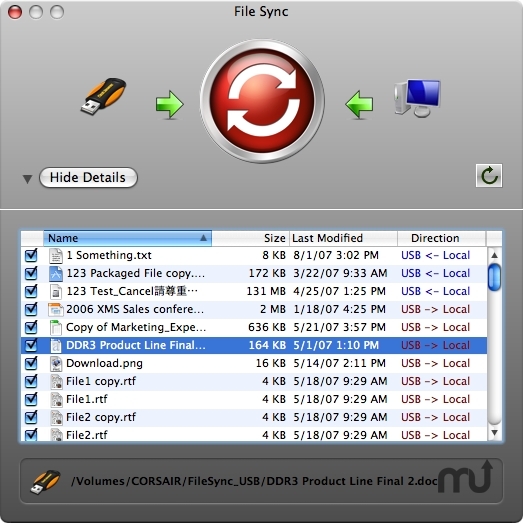 CorsairDriveTools is a collection of easy-to-use programs to enhance your USB Flash Drive experience. In this first public beta release, Corsair Drive Tools incorporates a file sync function that enables you to easily synchronize your data between computers at home and computers at work. This software is truly cross-platform for Mac and Windows. Both platforms share the exact same user interface and user preferences. There is no installation needed, and the app can be run from USB flash drive. No administration rights are required to run this software. CorsairDriveTools needs a rating. Be the first to rate this app and get the discussion started! Once you download the zip package, simply unzip the entire contents to the root of your USB flash drive.